Loving the new CCTV Brochures! Well its taken some time, in-between work and projects we finally finished designing and printing our new postcard sized brochure for our CCTV arm. It only took a little push from our friends down at Lilydale Police station to start getting our cameras out there in the market. We even had the our camera footage featured on Channel 9 & Channel 7 news! 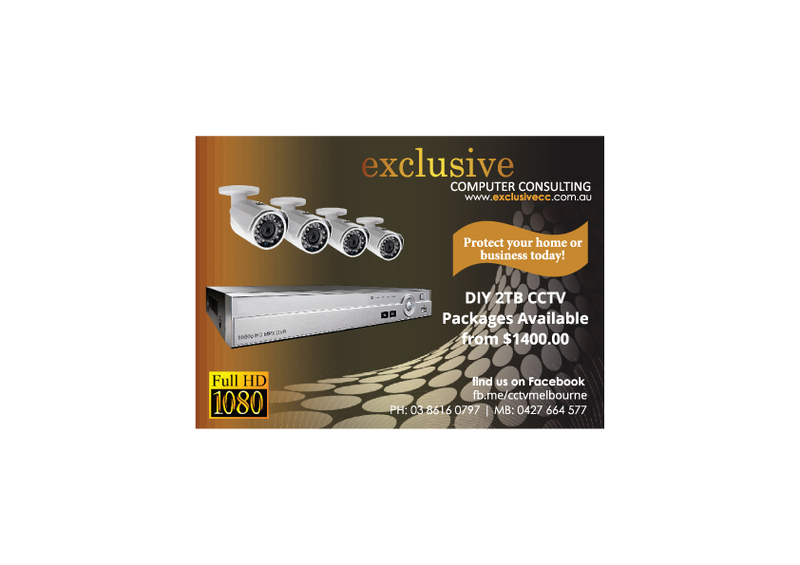 Using the same clean crisp design of our ExclusiveCC postcard brochure we added a brief description of CCTV and why you should invest in it as well as some of our top selling products. Today the family and I decide to grab the dog and go for a walk down to the industrial area of Lilydale and do a letter drop. Surprising we spoke to a few business owners who have either had break-in’s, theft or damage to their businesses and have been considering CCTV. We have some awesome products with so of the most advance features while all simple and easy to install. Our kits are the best way to go with everything you need to get set and online, we are even offering tech support! If you are not to handy or don’t have the time to install the system our good friends over at Melbourne Data & Electrical can get you setup and installed in no time.